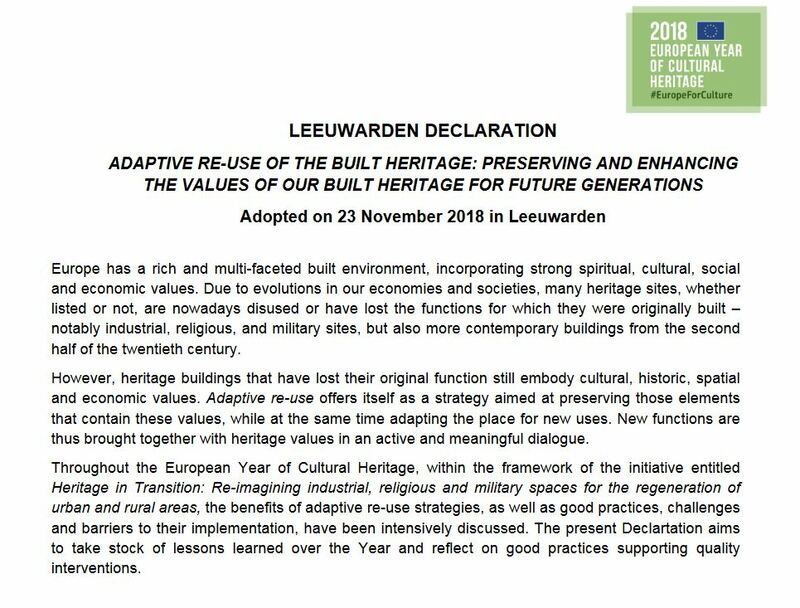 The Leeuwarden Declaration was presented during the conference Adaptive Re-Use and Transition of the Built Heritage organised by the Architects’ Council of Europe (ACE) in Leeuwarden, the 2018 European Capital of Culture, on 23 November 2018. On Friday 23 November, the Architects’ Council of Europe (ACE) organised in Leeuwarden, the 2018 European Capital of Culture, a conference on the Adaptive Re-Use and Transition of the Built Heritage. This event took place in the framework of the European Year of Cultural Heritage (EYCH) and related in particular to the initiative on Heritage in Transition: Re-imagining industrial, religious and military spaces for the regeneration of urban and rural areas. On this occasion, a Declaration supported by the European Federation of Fortified Sites (EFFORTS), Europa Nostra, and Future for Religious Heritage (FRH) was presented.